After a suitable period of deliberation and study (not to day hand-wringing and self-torture), I decided that I had to get the gunnels, breasthook, and knees right, or as right as I could get them at my current level of expertise. These are the most visible bits of joinery on a boat, and it's said that you can judge a boatbuilder's skill just by glancing at the way they all fit together. To leave them the way they were would be like saying "I just don't care." And I do. Actually, the gunnels themselves were fine. Or were fine until I over-clamped one end, trying to force it into shape. There must have been a small defect in the oak, because I broke off a corner. Most frustrating. My goal was still to refit Cabin Boy using wood I had on hand. I'm trying to preserve my limited building budget for the Blue Moon's cabin build. Unfortunately, I didn't have another 10' long piece of oak. This stymied me for awhile, until I realized I could simply scarf back on the 2 foot hunk I'd imprudently cut off a few days ago. A bit of a pain, but I'd get to practice my scarfing skills. I'd been reading one of the best boatbuilding books I've ever found, Walter Simmons "Lapstrake Boatbuilding". This book has a very useful hint on how to easily find the right angles for a scarf. From Walter Simmons "Lapstrake Boat Building"
I saw that illustration and thought "Hey, I can do that!" That is the sign of an excellent illustration and book, I think. I can't recommend this book high enough. Here are those simple lines on my two pieces of oak. I started to cut and then realized I'd forgotten to take a photograph. I made the cuts on my bandsaw and then finished the joint off with a wide chisel. Here they are laid side by side before gluing. Although I complain about epoxy from time to time, there's no doubt epoxy is perfect for scarfing. 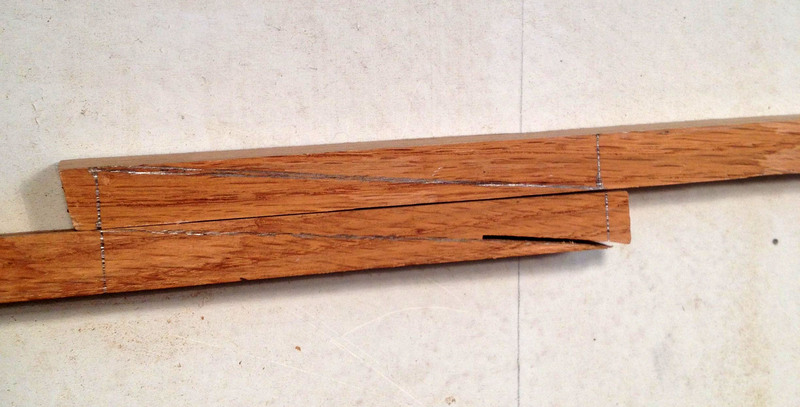 Some will say epoxy doesn't work on white oak, but if you read the West System manual, you'll find this is not true. You just need to make sure the surfaces are roughed up a bit with sandpaper and, if you are the cautious type, wiped with alcohol. Here's the scarf glued and clamped. I've got plastic wrap around the glued gunnel, to keep it from sticking to the table, and I've got an extra piece of oak on either side, to spread the clamping pressure. As alway with epoxy, you don't want to clamp too hard. 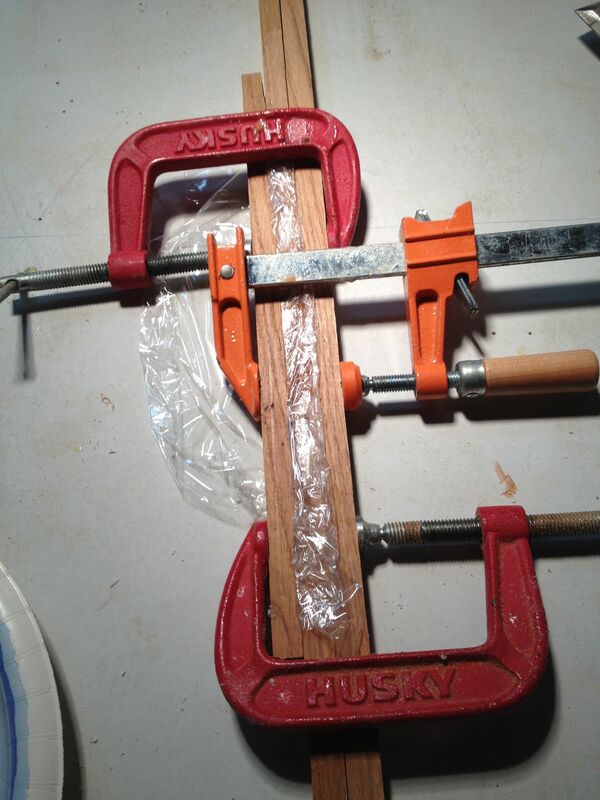 You need to leave the epoxy in the joint, and not squeeze it all out. The next day, I just gave the gunnel a light sanding to remove the excess epoxy. The results were quite alright, I thought. So, the next step will be to fit the gunnels and then spile out the shapes for the breasthook and knees. Stay tuned! I had to study the pictures before I understood what I was looking at, but now I get it. Very interesting, particularly for wide planks that would be hard to push through a bandsaw vertically. John, Very interesting as usual. I was faced with this while building a 22' long Whitehall out of western red cedar and the longest I could get boards was 20'. I was building a stripper and had to scarf almost all of the first 30 thin 3/8" X 3/4" strips to ad on a couple of feet or so. Like everything necessity is the mother of invention. I had a good Radial Arm saw and a long infeed outfeed table on both sides. I built a box to lay the strips and later gunwale pieces in as well and set the angle. I used 12-1 since I thought longer scarfs would be better and pushed the strips through the blade. Worked like a charm. Just used Titebond III for the glue. It was simple and straight forward. Yes, it's all pretty simple, really. That's why I try not to let the fact that I don't know what I'm doing half the time stop me. I figure I'll know how to do it when I'm done.